Lyn Evans, CERN physicist. 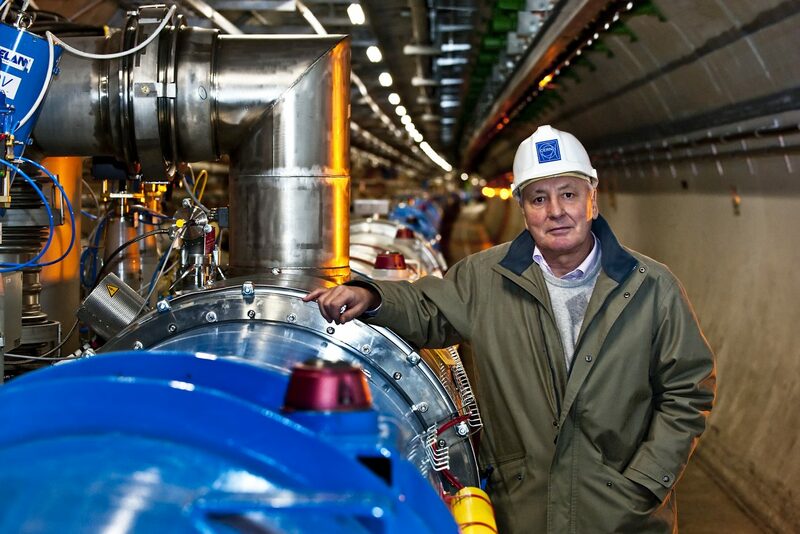 Lyn Evans (born 1945) is a Welsh physicist who became one of the leaders of the Large Hadron Collider (LHC) particle accelerator at CERN, the European particle physics laboratory. At left is part of the ring in which particles are accelerated to near the speed of light and then collided in detectors. Experiments carried out at the LHC intended to discover the Higgs boson led to the announcement of the discovery of a Higgs-like particle in 2012. 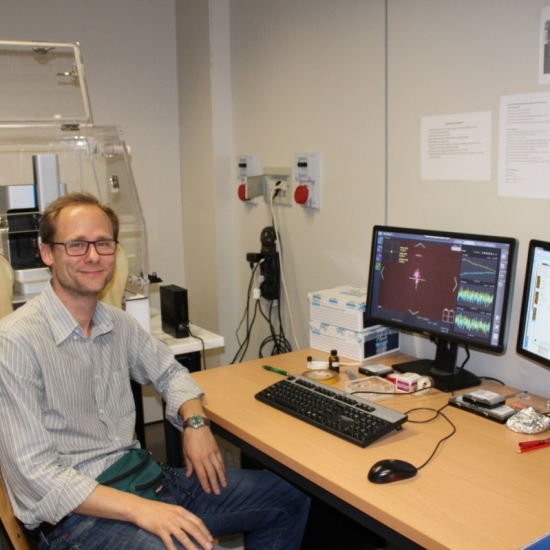 Evans and other CERN physicists have received awards in recognition of this work, including the Fundamental Physics Prize in 2012. Photographed in 2008. A new era of discovery in particle physics opened in November 2009 with the start-up of the Large Hadron Collider at CERN in Geneva, Switzerland. Based on experiments and discoveries over the last decades, physicists believe that the Terascale will yield evidence for entirely new forms of matters, and possibly even extra dimensions of space. This new matter includes the Higgs particle, as well as the possibility of an extended family of elementary ‘superparticles’, the heavier cousins of the particles we already know. Lyn Evans joined CERN at 24 and after 40 years with CERN, he is now the Director of Linear Collider Collaboration and on brink of announcing the next generation Higgs Factory, the International Linear Collider Project proposed to be built in Japan as a world-wide collaboration to discover new physics. “The idea of an International Linear Collider is not a new one,” explains Lyn Evans, who has been a champion of this project for many years. 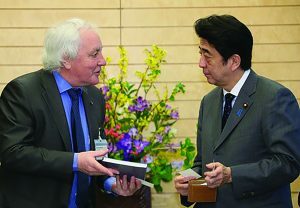 In March, 2013, Lyn Evans paid a courtesy visit to Japan’s Prime Minister Shinzo Abe. The Prime Minister acknowledged the significance of the linear collider project for the whole of humankind. Given that it is an international project, he said he needed to monitor the development closely and would continue to investigate the role of Japan. With this deadline approaching, things are speeding up. 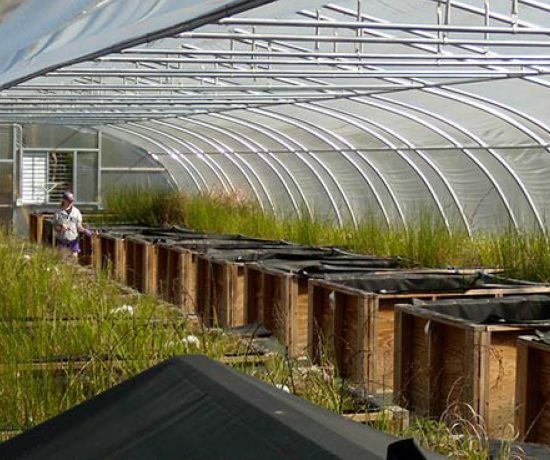 It is very natural for this accelerator to be cited in Japan. In the 1930’s Japan took an early lead in particle physics and in recent decades they have continued to be important players in experimental physics. Based on recent exciting news from the Governors Meeting in Japan, Evan’s dream may soon become a reality. “It is a great time for Japan to take a leading role in Linear Collider technology. The whole world will benefit from the data it will produce,” stressed Evans. 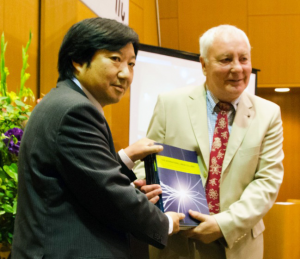 Kicking things off in Tokyo, in 2013, Linear Collider Board Director Sachio Komamiya hands over the ILC Technical Design Report to Lyn Evans, Linear Collider Collaboration director. The International Linear Collider will give physicists a new cosmic doorway to explore energy regimes beyond the reach of today’s accelerators. A proposed electron-positron collider, the ILC will complement the Large Hadron Collider, a proton-proton collider at the European Center for Nuclear Research (CERN) in Geneva, Switzerland, together unlocking some of the deepest mysteries in the universe. With LHC discoveries pointing the way, the ILC – a true precision machine – will provide the missing pieces of the puzzle. and can only account for a surprising five percent of the universe. The remaining 95 percent, the mysterious dark matter and dark energy is what the proposed International Linear Collider could explain. Not to exclude the potential of new forms of matter, new forces of nature, new dimensions of space and time and even extra dimensions. 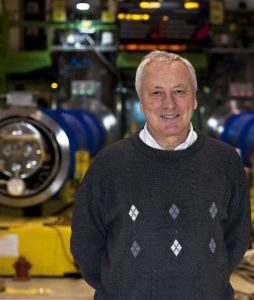 Lyn Evans led the project to build CERN’s Large Hadron Collider (LHC) from its inception in 1994 until start-up on 10 September 2008. The LHC, which is the world’s highest energy particle accelerator, is the Organization’s latest flagship research facility. 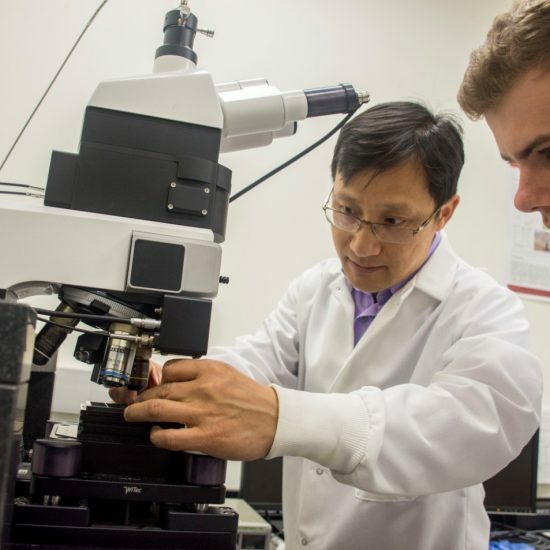 It is poised to provide new insights into the mysteries of our universe. Nations from around the globe have contributed to the construction of the accelerator and its experiments. China’s plans to build a huge underground ‘Higgs factory called the China Electron Positron Collider that will be a successor to the Beijing Electron Positron Collider at the Institute of High Energy Physics in Beijing, which is expected to shut down in 2020. 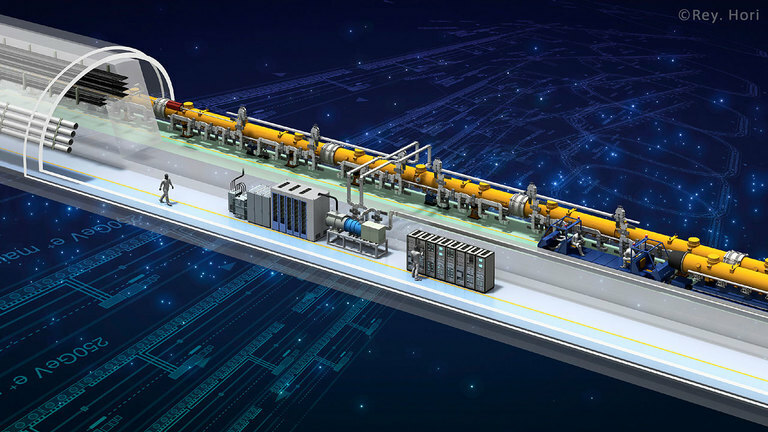 Plans are well underway with a conceptual design report for the China Electron Positron Collider that calls for a 100 km underground tunnel that would smash together electrons and positrons at energies of 240 GeV. If built, this will be the largest electron-positron collider with a circumference of 100 km with a precision down to 1%, allowing scientists to probe into new physics. Does the world need two Higgs Factories? On June 4, 2018, CERN released new results from the ATLAS and CMS experiments at the LHC revealing how strongly the Higgs boson interacts with the heaviest known elementary particle, the top quark, corroborating our understanding of the Higgs and setting constraints on new physics. The Higgs boson interacts only with massive particles, yet it was discovered in its decay to two massless photons. Quantum mechanics allows the Higgs to fluctuate for a very short time into a top quark and a top anti-quark, which promptly annihilate each other into a photon pair. These results tell scientists more about the properties of the Higgs boson and give clues for where to look for new physics. The International Linear Collider (ILC) is a gigantic new accelerator to study the mysteries of the universe. In 2012, one of the elementary particles known as the Higgs boson was discovered at CERN. 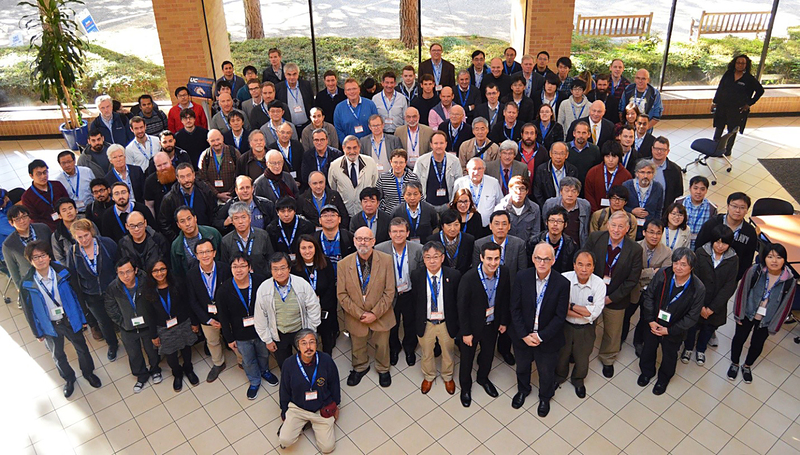 For about 5 years, led by Dr. Lyn Evans, Japan has been encouraged to host the next large accelerator which will be a Higgs factory, where many exciting discoveries in Physics can be realized. 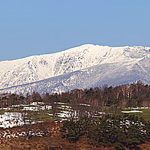 The Japanese high-energy physics community’s recommendation: If the 19-mile-long, next-generation particle collider is built in Japan, it should be located in the Kitakami mountains of the Iwate and Miyagi prefectures. The ILC will create an international hub of science, technology and innovation in the area, and an “international science city”. Adding that he believes it is the time for Japan to stand up and lead the ILC project, he presented the many meetings and discussions leading up to the workshop including the creation just last month by the Liberal Democratic Party of a new organization, called the Liaison Committee for Realizing the ILC which brings together various strategic groups involved in making important policies, such as science technology and innovation, regional revitalization, reconstruction from natural disasters, and national resilience. The Liaison Committee formulated their strategy to realize the ILC, by integrating the ILC project across various important policies for Japan and is working with Party members, and the Prime Minister and his Cabinet, so that the Expression of Interest can be delivered in time.